Do I Need To Comply? 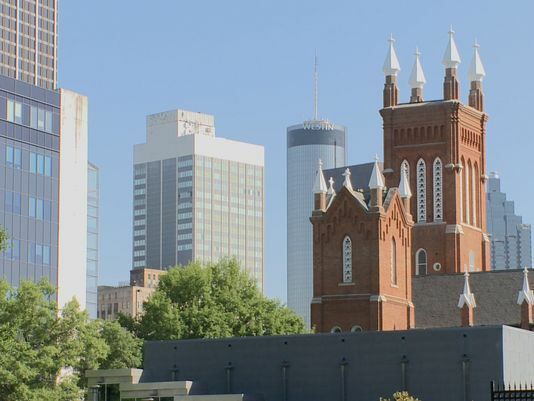 The US Green Buildings Council has just published a feature on Atlanta’s commercial building energy efficiency efforts. The article highlights Atlanta’s ordinance, which strives to bring better data and increased attention to resource use in the buildings space, along with realizing the private sector monetary savings, the public health improvements, and the overall sustainability benefits of energy efficiency. To read the article, click here. ATLANTA – The Mayor’s Office of Sustainability reminds commercial building owners to meet the upcoming energy benchmarking data submission deadline of Monday, July 20. Passed in April, the Commercial Buildings Energy Efficiency Ordinance (15-O-1101) requires private and City-owned buildings over 50,000 square feet in size to benchmark and report their energy use annually to the City of Atlanta. Utilizing the data collected, building owners will complete an energy audit once every 10 years. An energy audit is a detailed assessment of how a building could improve its performance through upgrading its equipment and systems. In addition, building performance data collected under the benchmarking initiative will be made transparent to the public to allow the market to recognize, reward, and drive increased demand for high-performing buildings and to focus programmatic efforts. Building representatives can determine if a property is required to benchmark this year by visiting www.atlantabuildingefficiency.com and clicking on the “How to Comply” tab. Failure to comply with this year’s benchmarking submission requirement will result in a fine of $1,000 per property. All covered properties were issued notification letters that included assistance resources and the upcoming deadline this past June. Since the ordinance’s adoption, more than 270 building professionals have been trained on the new law. The Mayor’s Office of Sustainability has created a number of online and in-person resources in addition to the building efficiency website, including a live help desk operated by Southface and a free Energy Star Portfolio Manager training series hosted by the Building Owners and Managers Association (BOMA) of Georgia and Southface. The Southface Helpdesk offers support via one-on-one consultation to owners and operators needing assistance with benchmarking. The Helpdesk can be reached at (404) 604-3665, or by email at benchmarkhelp@southface.org. The Mayor’s Office of Sustainability is focused on embedding sustainability best practices into Atlanta city government and across the community. For more information about Atlanta’s efforts to create a more sustainable city, please visit the Office of Sustainability’s page at http://p2catl.com. Follow the Office of Sustainability on Facebook and Twitter @ATLSustainable. ATLANTA – The City of Atlanta announced today that it has adopted a comprehensive energy policy that aims to significantly reduce citywide commercial energy use by establishing a framework for energy performance monitoring and systems maintenance. Authored by the Mayor’s Office of Sustainability, the ordinance aims to reduce the city’s energy footprint while creating jobs. The City projects that the ordinance will drive a 20 percent reduction in commercial energy consumption by the year 2030, spur the creation of more than 1,000 jobs a year in the first few years, and reduce carbon emissions by 50 percent from 2013 levels by 2030. Atlanta’s Commercial Buildings Energy Efficiency Ordinance addresses energy use in private and City-owned buildings over 25,000 square feet in size – 2,350 buildings that, as a whole, currently represent 80 percent of the city’s commercial sector. Participating buildings will be phased in, beginning with municipal buildings in 2015 and expanding to include private buildings in 2016. The City of Atlanta is the largest property owner impacted by the legislation with some 110 building subject to the portfolio requirements. Already benchmarking its assets, the City is expected to begin performance reporting in the fall of 2015. Under the legislation, building owners of the designated buildings are required to benchmark and report to the City their properties’ energy use annually. Utilizing the data collected, building owners will complete an energy audit once every 10 years. An energy audit is a detailed assessment of how a building could improve its performance through upgrading its equipment and systems. In addition, building performance data collected under the benchmarking initiative will be made transparent to the public to allow the market to recognize, reward, and drive increased demand for high-performing buildings. The Atlanta Commercial Buildings Energy Efficiency Ordinance is part of the City’s work under the City Energy Project, which is developing locally-tailored plans and programs to create healthier, more prosperous, and more resilient cities by reducing carbon pollution from buildings. Other participants include Boston, Chicago, Denver, Houston, Kansas City, Los Angeles, Orlando, Philadelphia and Salt Lake City. By investing in building energy efficiency programs and policies, together the City Energy Project participants are projected to cut up to 7 million tons of carbon emissions annually and save residents and businesses a combined total of nearly $1 billion annually on their energy bills. The City Energy Project is a national initiative from the Institute for Market Transformation and the Natural Resources Defense Council to create healthier and more prosperous American cities by improving the energy efficiency of buildings. Working in partnership, the Project and the 10 participating cities will support innovative and practical solutions that boost local economies, reduce pollution, and create healthier environments. The project is funded by a partnership of Bloomberg Philanthropies, Doris Duke Charitable Foundation, and Kresge Foundation. For more information, visit cityenergyproject.org.